I know I’ve been very quiet lately but I haven’t been slacking. I’m trying to complete the In a Spin hand-quilting. 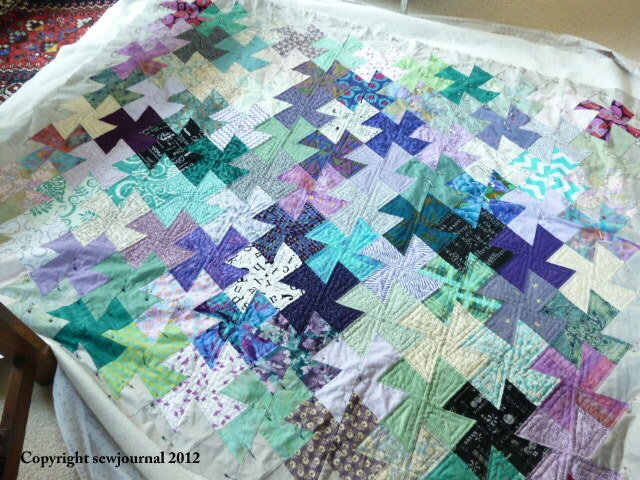 I’ve completed 51 of the 99 blocks and then after that I have to quilt the border so I’m less than half-way there. I’ve also joined the Greater Western Sydney Modern Quilt Guild. I don’t really like the word “Modern” as for me it has connotations of minimalistic ugliness in architecture and interior design. I prefer the word contemporary to describe the kind of quilts that aren’t just copies of traditional quilt designs. I don’t want to get into a whole controversial debate here either. I’m not saying one is better than the other. There are examples of both I really like and examples of both that I really dislike. Anyway the first meeting of the GWSMQG was lovely. Everybody was very enthusiastic, friendly and there was lots of interesting show and tell. 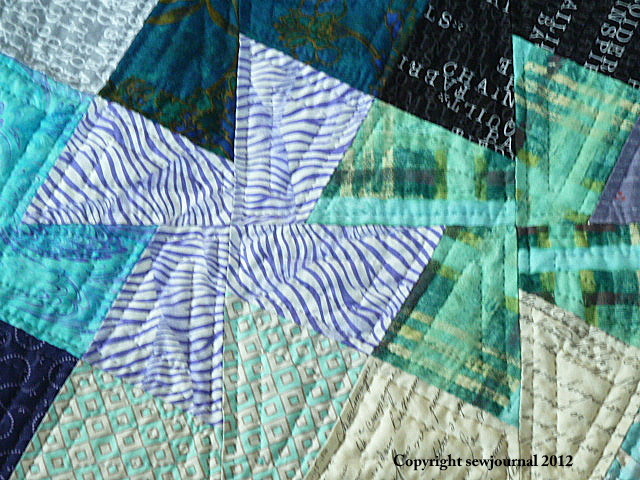 Here are a few photos of the In a Spin quilting. So tell me… what are you working on at the moment? Thanks Annette. I like both sorts of quilts and I also like flannel quilts. They are so snuggly. After many years of “stitch-in-the-ditch” I have finally taken it upon myself to learn how to quilt by hand. I love your work and want to thank you for the You-Tube video that got me going. I spent most of yesterday reviewing videos in an attempt to try hand quilting with out getting frustrated, yours was the only one that made any sense to me. Besides I can do it without all of those thimbles that interfere with the tactile pleasure of the quilt in my hands and I don’t have to spend money on a hoop or frame. Now all of those quilt tops that had been sitting for so long because they deserved more than “in the ditch” will be completed. I’m really thrilled that you found my video useful. Thank you so much for letting me know. If you have any questions as you go along feel free to ask. Also do send me some photos of the finished articles. I’d really like to see them.